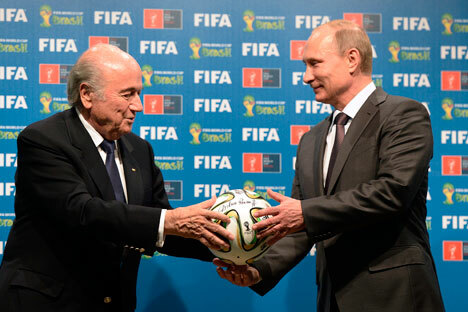 Russian President Vladimir Putin believes that FIFA head Sepp Blatter deserves a Nobel Prize for his work. "I think that people like Blatter, the outstanding heads of international athletic federations and Olympic committees like him, deserve special recognition and gratitude," Putin said in an interview with Switzerland's RTS television and radio station. "If there is anyone who deserves Nobel Prizes, it is those people," the Russian president said. It is these people who "perfect mechanisms of cooperation between countries and make a huge humanitarian contribution to the development of good neighborly relations between people and states," Putin said. "We are all aware of the situation that surrounds Blatter," he said. "I do not want to go too much into detail, but I personally do not believe a single word with regard to [allegations] of corruption facing him," Putin said. When commenting on the corruption scandal engulfing FIFA today, Putin noted that all appropriate measures should be taken within the framework of international law. "No one is opposed to the fight against corruption. Everyone is for it. But there are norms of international law. And if anyone is suspected of committing a crime, the required evidence is collected and transferred to the Prosecutor's Office of the state whose citizenship this person holds," the Russian president said. "No one, not a single country - either big or small - can move around the world and capture whoever they want and drag them into their prisons," the Russian leader said. "For me, it is unacceptable," Putin said. In the interview with the RTS channel, Putin was also asked whether or not his lengthy stay in power had had a negative psychological effect on him. "Did I look like a crazy person to you during this interview?" Putin responded. The journalist then told the Russian president that "in Europe today he is being portrayed as some sort of the new Stalin, and there are people who describe him as an imperialist." "It has been an element of the political struggle, a part of my life for quite a large number of years. I try not to pay too much attention to it. I simply do what I deem necessary for the benefit of my country and my people," Putin said. "Confrontation with other countries is not in Russia's interests, but sometimes we have to defend our interests, and, beyond any doubt, we will certainly do so," he said. "But we will not look for this solution through confrontation, let alone military confrontation. Rather, we will do so through a search for compromises and mutually acceptable decisions," Putin said.